Your situation won't allow for a Lift? Maybe your water is just a little too shallow, or fluctuates too much to allow for a lift. Perhaps you have an underdeck lifting system on your pontoon that takes the place of a lift. MAX has the answer to provide the ultimate shelter and element protection for your craft. 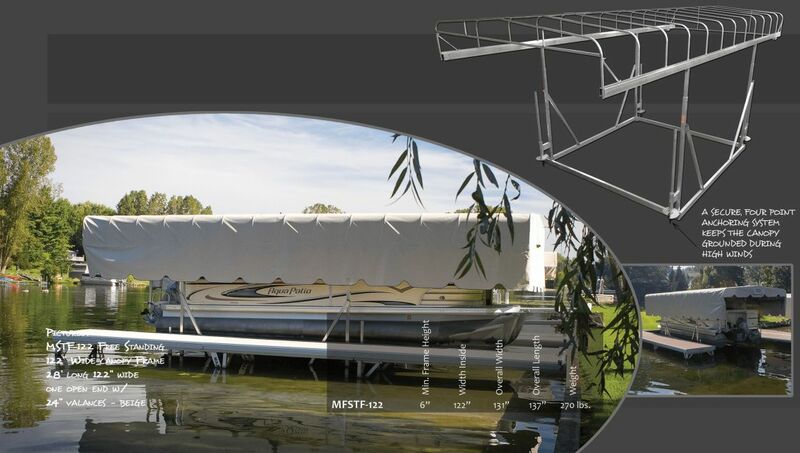 Based on a stretched version of the MVL35122 Lift Tower Frame and utilizing the Stordry canopy Frame, the MAX Free Standing Canopy Frame allows you to have all the protection advantages of a lift or boat house. Simpler, easier, and less time consuming than pontoon covers or boat mooring covers, the MAX Freestanding Canopy Frame allows you to enjoy your day on the lake. The MAX Freestanding Canopy Frame comes standard with an extended, fully welded V-Tower frame, a four post anchor kit with 5' dock poles, and both mud and sand augers to anchor theframe at your dock. Choose open- or closed- end frames and fabric to create this premium pontoon or boat shelter.